Where do they come from? What are the advantages of keeping them pure bred? What are Akhal Tekes good at? Is crossbreeding them with other horses a good idea? WHAT ARE THE ADVANTAGES OF THE AKHAL TEKE? They are more "human". You can bond with them more closely, comparable to the Arab. They are more intelligent which might be a problem when dealt with by "silly" owners. They learn more quickly which could constitute difficulties if they are asked to do things over and over again, resulting in boredom and stubbornness.  According to Italian research the percentage of red blood cells is said to be significantly higher than any other breed. This fact is supported by Mr. Mino Denti (Italy). He has his horsesÕ blood tested at regular intervals. An untrained Teke has more red blood cells than a trained Thoroughbred. This is an indicator of their stamina. They are born to cover long distances.  They move smoothly because of their long back. Their gaits are smooth without much upward movement, which is very convenient for the rider. Their movements are extremely elastic. WHAT ARE THE ADVANTAGES OF KEEPING THEM PUREBRED?  If you keep them purebred they will maintain their good genes, thus pertaining to their good traits. This is an excellent breed and man has a responsibility to preserve it. IS CROSSBREEDING WITH OTHER HORSES A GOOD IDEA?  Crossbreeding the Teke in order to produce another type or other traits in a Teke is not a good idea, as it is simply unnecessary. 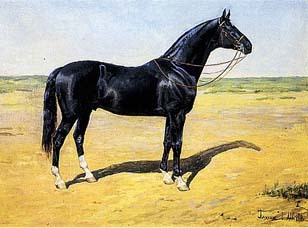 The Russians crossed the Akhal Teke with the Thoroughbred in the early 1920's and they found this was of no advantage to the Akhal Teke breed.  Crossbreeding other breeds with Teke blood has been done throughout history to produce the Trakehner, probably the Thoroughbred and many Arabian lines (Munique), all kinds of Russian breeds.It is still a way of improving another breed.  "Turkmen Atti" is an Akhal Teke stallion that was used in Germany to develop the Trakehner breed. This is a one-person horse that is best suited to do well with one trainer and one rider. The horse bonds usually to one person and would stay bonded for life if this were possible. The reason why Absent did so well in three successive Olympic Games is maybe, due to having the same groom during this period of time. If it wasnÕt for this groom, it may not have been possible for him to do so well, as he had a different rider in the third Olympics. The Akhal Teke is not a horse to be taken up and then sold when the owner has run out of enthusiasm. If this is the case, you will not get the best from this type of horse.